The 2015 Oxnard train derailment occurred on February 24, 2015 when a Metrolink passenger train collided with a truck on a grade crossing and derailed at Oxnard, California, United States. The train engineer died from his injuries a week later and 29 others were injured. A Metrolink train similar to the one involved in the accident. An overpass had been planned for almost two decades for the Rice Avenue crossing where the accident occurred. Funding, however, remained unavailable in Ventura County for the estimated $35 million grade separation project. The accident occurred at 5:44 a.m. local time (13:44 UTC) when a passenger train collided with a 2005 Ford F-450 pick-up truck and trailer on the Rice Avenue grade crossing in Oxnard, California. The train derailed, with three cars falling onto their sides and a fourth remaining upright, as did the locomotive which was pushing the train from the rear. The train was traveling from East Ventura to Los Angeles and was accelerating after leaving the Oxnard station 2 miles (3.2 km) away from the crash site. It was traveling at 64 miles per hour (103 km/h) when the emergency brakes were applied and had slowed to 56 miles per hour (90 km/h) when it hit the truck. The train's usual cruising speed is 79 miles per hour (127 km/h); it was traveling under that speed. The train cars consisted of a Hyundai Rotem cab car #645, three Hyundai Rotem bi-level cars #206, #211 and #263, and an EMD F59PH diesel-electric locomotive #870 at the rear. All four cars derailed, with #263 remaining upright. According to the train crew, the truck appeared to possibly have been on fire before the collision. However, this was likely to have been the flashing headlights of the vehicle, which was facing the train, as the driver attempted to signal to the train crew that he was ahead of them. The train was being operated at the time by a student engineer with the train engineer in the control cab with him. The truck driver is reported to have driven along the tracks having turned too early before the intersection at Fifth Street and then having gotten his wheels jammed in the tracks from which he was then unable to extricate it. The truck was 80 feet west of the intersection and facing the train when the accident occurred. There were 48 passengers and three crew on board the train. Of those, 30 were injured. Initially, 28 of the injured were taken to hospital; 20 were released and eight were admitted, four of them said to be in critical condition. Later, two more passengers were transported to hospitals and released. Victims were treated at the Community Memorial Hospital, Los Robles Hospital & Medical Center, St. John's Regional Medical Center, St. John's Pleasant Valley Hospital, and Ventura County Medical Center. The truck driver was Jose Alejandro Sanchez-Ramirez, 54, who did not speak English, and who had a previous DUI conviction in his home state of Arizona although there was no indication that he was intoxicated at the time of the accident and no charges of being intoxicated were ever brought against him.[relevant? – discuss] Sanchez-Ramirez left the scene on foot following the accident, but was later taken into custody about a mile away. According to his attorney, the man was trying to summon help in a remote part of the county without a vehicle and with no guarantee anyone he found would be able to communicate with him. When he finally encountered police officers, he handed them the cell phone on which he had been talking to his son so that his son could explain to the officers what had just happened to the train. He was booked on suspicion of hit and run and held on $150,000 bail, but prosecutors later declined to file criminal charges against him and he was released two days later. Sanchez was due back in court in May 2015. Metrolink trains between East Ventura and Moorpark were cancelled. A bus service was provided for passengers traveling to these stations. Local roads around the scene of the accident were closed. Amtrak Pacific Surfliner service between Los Angeles and Goleta, that uses the same Union Pacific coast line, was also cancelled. The train engineer, Glenn Steele, 62, was one of the critically injured and died one week later. After the accident, Steele experienced two cardiac arrests on Wednesday February 25, but lived after those events. At the time of his death, Steele was the most senior engineer with Metrolink, having spent half of his 42-year-long Amtrak career with Metrolink. Steele died at Cedars-Sinai Medical Center early on March 3. A resident of Homeland, California, Steele was a grandfather. In March 2015, two of those injured due to the crash sued the truck driver, and his employer, Harvest Management LLC. On February 22, 2016, Jose Alejandro Sanchez-Ramirez was charged with manslaughter by Ventura County prosecutors. The National Transportation Safety Board has launched an investigation into the accident. A Go-team was dispatched to the scene. The train was fitted with a forward-facing camera in the cab car. The NTSB has verified that the forward-facing camera was recording data and the collision itself was recorded by the camera. Although it was initially stated that the truck became stuck on the tracks, NTSB later clarified that it is unclear if the vehicle was stuck and that it was not a typical grade crossing incident where a vehicle is crossing the tracks and is stopped or struck before completing the crossing. The vehicle was not in the crossing nor between the crossing arms. The Federal Railroad Administration opened an investigation into the accident, the twelfth at the crossing in ten years. An average of eight passenger and 24 freight trains use the line in each direction each day. A preliminary report was published on March 19, 2015. In the report, it was stated that when the truck was struck, its driver-side door was open and its headlights and emergency lights were flashing. A report later that year found that the cow-catcher and a coupler on the train had manufacturing flaws, although no conclusion was reported regarding their role in the crash. On July 8, 2016, the Metrolink board approved a $1.5 million plan to repair the plows on the Hyundai Rotem cab cars. Once the repairs are completed, the cars will return to service and the leased BNSF locomotives will be returned. Wikimedia Commons has media related to 2015 Oxnard train derailment. ^ Weikel, Dan; Nelson, Laura J. (March 1, 2015). "Spending on rail crossing safety upgrades varies widely across Southland". Los Angeles Times. Retrieved March 3, 2015. ^ a b c "California train derails after collision with truck". BBC News Online. February 24, 2015. Retrieved February 24, 2015. ^ a b c "Metrolink train slams into truck in Oxnard; driver arrested for hit-and-run". KABC-TV. February 25, 2015. Retrieved February 25, 2015. ^ a b "Metrolink Train Derails In Oxnard After Colliding With Truck On Tracks". CBS News Local. February 24, 2015. Retrieved February 24, 2015. ^ a b "NTSB Member Robert Sumwalt's third briefing on the Metrolink grade crossing accident in Oxnard, CA" (video (25m 32s)). National Transportation Safety Board. February 26, 2015. Retrieved February 26, 2015. ^ a b c Covarrubias, Amanda; Rocha, Veronica; Sahagun, Louis (February 24, 2015). "Metrolink train hits truck, derails in Oxnard; truck driver in custody". Los Angeles Times. Retrieved February 24, 2015. ^ Moreno, John A.; Romero, Lynette; Spillman, Eric; Pascucci, Christina; Pamer, Melissa; Hawkins, Kirk; Chenc, Kimberly (February 25, 2015). "NTSB Obtains Video, Data Recorders From Train in Oxnard Metrolink Crash". KTLA. Retrieved February 26, 2015. ^ Rocha, Veronica; Serna, Joseph; Mejia, Brittny (February 26, 2015). "Metrolink derailment: No charges filed against truck driver for now". Los Angeles Times. Retrieved February 26, 2015. The Metrolink train was traveling 56 mph when it hit the truck, well below the 79-mph speed limit, Sumwalt said. ^ a b c "Preliminary Report Highway HWY15MH006" (PDF). National Transportation Safety Board. Retrieved March 19, 2015. ^ a b c Rocha, Veronica; Serna, Joseph (3 March 2015). "A week after Metrolink train crashes into truck, engineer dies". Los Angeles Times. Retrieved 3 March 2015. ^ "NTSB media briefing, February 24, 2015" (video (19m 20s)). National Transportation Safety Board. February 24, 2015. Retrieved February 25, 2015. ^ a b c "Member Sumalt holds second on scene media briefing on grade crossing accident in Oxnard, CA" (video (20m 43s)). National Transportation Safety Board. February 25, 2015. Retrieved February 26, 2015. 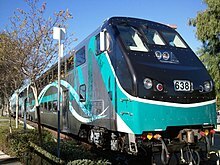 ^ "OXNARD: 28 hurt when Metrolink train crashes into truck (UPDATE)". The Press-Enterprise. February 24, 2015. Retrieved February 24, 2015. ^ a b "Grade Crosssing Accident, Oxnard, CA". National Transportation Safety Board. February 24, 2015. Retrieved February 24, 2015. ^ a b c "Metrolink train hits a vehicle in Oxnard". Ventura County Star. February 24, 2015. Retrieved February 24, 2015. ^ "Dozens injured in Metrolink train collision transported to area hospitals". KABC-TV. February 24, 2015. Retrieved February 25, 2015. ^ Whitcomb, Dan (February 25, 2015). "Truck driver in California train crash had DUI conviction: L.A. Times". Yahoo! News. Reuters. Retrieved February 26, 2015. ^ "Metrolink train crash: Train's camera captured video of truck crash (update)". KPCC. Pasadena, California. Associated Press. February 25, 2015. Retrieved February 26, 2015. Ramirez only speaks Spanish, and two people he encountered in the area could not understand him, the lawyer said. ^ a b Mohney, Gillian (February 24, 2015). "Metrolink Crash: Driver Flees Scene After Train Collides With Truck". ABC News. Retrieved February 24, 2015. ^ Melissa Pamer; Christina Pascucci; Kirk Hawkins (25 February 2015). "Driver of Pickup Truck in Metrolink Crash Was Going to Get Help, Not Fleeing, Attorney Says". KTLA 5. ^ Ashley Soley-Cerro; Lynette Romero; Melissa Pamer; Kareen Wynter; Christina Pascucci; Courtney Friel; Kimberly Cheng; Steve Kunj; Kirk Hawkins (February 25, 2015). "Truck Driver Taken Into Custody on Suspicion of Felony Hit-and-Run in Metrolink Crash". KTLA. Retrieved February 26, 2015. ^ "Driver freed without charges in California train crash". Washington Post. Associated Press. 27 February 2015. Retrieved 1 March 2015. ^ Russell, Joel (20 March 2015). "NTSB Metrolink Crash Report: Driver Made Wrong Turn". San Fernando Valley Business. Retrieved 1 April 2015. ^ Serna, Joseph; Rocha, Veronica. "Train engineer dies of injuries suffered in Metrolink crash with truck". LA Times. Retrieved March 3, 2015. ^ Kurzweil, Anthony (3 March 2015). "Engineer Aboard Metrolink Train That Collided With Truck in Oxnard Dies". KTLA. Los Angeles. Retrieved 3 March 2015. ^ Antczak, John (3 March 2015). "Engineer in Southern California train crash dies". San Francisco Chronicle. Associated Press. Retrieved 3 March 2015. ^ Watts, Amanda (4 March 2015). "Engineer in California Metrolink train crash dies". CNN. Retrieved 3 March 2015. ^ Chu, Hanna (3 March 2015). "METROLINK ENGINEER DIES FOLLOWING OXNARD TRAIN CRASH". LABC. Los Angeles. Retrieved 3 March 2015. ^ Weikel, Dan (11 March 2015). "Two people seriously hurt in Oxnard Metrolink crash file lawsuits". Los Angeles Times. Retrieved 1 April 2015. ^ "Metrolink to enhance safety and performance by adding locomotives". Metrolink. September 3, 2015. Retrieved September 7, 2015. ^ Weikel, Dan (September 3, 2015). "Metrolink examining safety of state-of-the-art rail cars in wake of Oxnard crash". Los Angeles Times. Retrieved September 7, 2015. ^ Abdollah, Tami. "County files manslaughter charge in California train crash". Associated Press. The Associated Press. Retrieved 23 February 2016. ^ "NTSB Launches Go-Team to Grade Crossing Accident in Oxnard, CA". National Transportation Safety Board. Retrieved February 24, 2015. ^ "Pacific Surfliner" (PDF). Amtrak. Retrieved March 3, 2015. ^ Scheibe, John (23 March 2016). "Arraignment postponed in fatal Oxnard Metrolink crash". Ventura County Star. Retrieved 28 October 2016. The National Transportation Safety Board released a preliminary report about a month after the fatal train crash. The report stated Sanchez-Ramirez drove about 80 feet on the tracks before the truck got stuck. The truck's headlights were on, its emergency lights were flashing and the driver's side door was opened when the train hit it, the agency stated. ^ Weikel, Dan (2015-12-16). "Metrolink train cars that derailed in Oxnard had flawed parts, confidential report finds". LATimes.com. Los Angeles Times. Archived from the original on 2015-12-16. ^ "Metrolink approves $1.5 million to repair defective cab cars". Los Angeles Times. July 8, 2016. Retrieved July 9, 2016.